A warm hello to you from me. Julie Zommers here! It’s always great to know who’s behind a website and why they do what they do. So here’s a little snapshot of me! 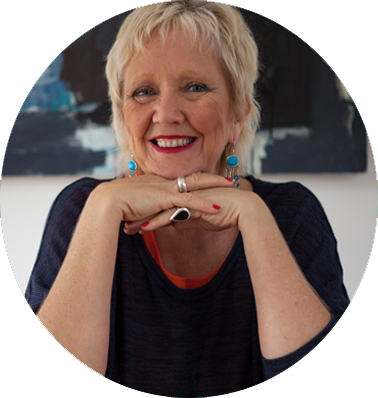 I’m a Sydney based writer & therapist. I love my work. It’s like play to me, because I enjoy it. Does that mean I don’t take other people’s problems seriously? I absolutely do. I also know that healing doesn’t have to be serious and painful. It can be a joy to finally release all of the things that have been keeping you in a holding pattern. Six facts about me: I’m a Mum and Nana, have a warped sense of humour, have a plethora of things that have gone wrong in my life, have a plethora of things that have gone right in my life, I always lick the lid of yoghurt, I enjoy nothing more than helping people fall in love with who they are. It changes their life. A 10 year ‘encounter of the anxiety kind’ in my 20′s, almost stopped me in my tracks. 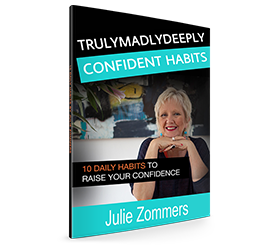 It stripped me of my confidence and scared the heck out of me. Whereas I may have appeared normal on the outside, on the inside I could barely recognise myself. I decided, when I finally gave anxiety the flick, that my sole purpose in life, apart from loving my family and friends, was to BE HAPPY, and in the process, spread happiness. During my quest to find out how to do just that, I happened upon energy medicine. I’m now a practitioner of both the Emotional Freedom Techniques (tapping) and Matrix Reimprinting, I’ve studied NLP and just about every branch of philosophy. I blend these into my work with clients, helping people love themselves, and therefore have happier existences on ye old planet earth. The no one needs ‘fixing’. We’re all ok. Large doses of love, combined with some stunning 21st Century cutting edge techniques can peel off the false notions we have about ourselves, leaving our beautiful inner core, which has been there all along. I think everyone deserves to find their light and let it shine. I hope you enjoy what I have to offer on this site. Happy exploring! P.S. If you’d like to receive my Daily Heart Messages like this one below, sign up to receive them each day! 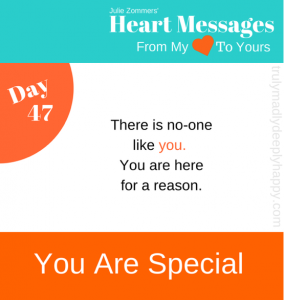 Heart Messages from my Heart to Yours! I read this article and found it very interesting, thought it might be something for you. The article is called About and is located at https://trulymadlydeeplyhappy.com/about/.